Information governance is the activities and technologies that organizations employ to maximize the value of their information while minimizing associated risks and costs. 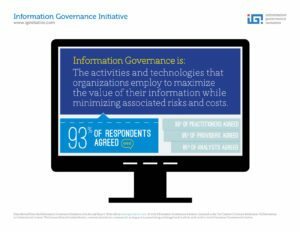 The Information Governance Initiative is a cross-disciplinary think tank and community dedicated to advancing information governance. Like-minded people must come together to find a better way to use and manage information. Please join us.